Celebrate the Scottish language with Glaswegian designers Bonnie Bling who make acrylic jewellery inspired by Scottish slang. You may remember the Amelia Lily knuckle dusters on X Factor? They designed them in collaboration with Obscure Couture. You can get your own custom-made pair for £40. Although knuckle dusters played a part in my husband and I getting together (yeah, a long story) I can’t think of an occasion that I would wear knuckle dusters, but this I heart Haggis necklace is very appropriate for Burns Night tonight. I’m afraid I really don’t heart haggis, but I’m going to try to like Scotland’s national dish by making this veggie version I saw over on Domestic Sluttery. If you don’t have pierced ears these Och Aye earrings are available as cufflinks or knuckle dusters or without the ‘Aye’ as a brooch and necklace. 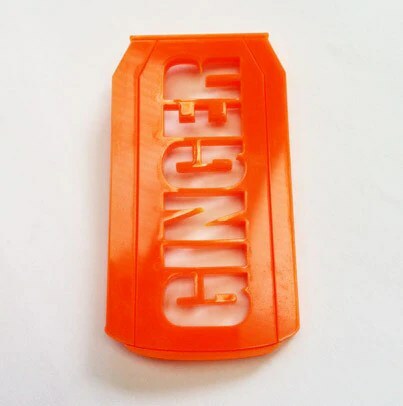 The Ginger badge is definitely my favourite. I think because it reminds me of my brother and of Irn Bru – two of my favourite things. Enjoy your Burns Night celebrations!